Have you heard about Every Door Direct Mail? With Every Door Direct Mail service, you have an easy, cost-effective way to reach every address near your business...both residential and commercial...quantities from 200-5000 pieces. According to BizReport 2010, up to 85% of a store’s customers come from a 5-mile radius. Now, with Every Door Direct Mail®, you can reach every address in the area surrounding your business. We’ll print your piece and show you how to take it to the post office and mail it for 14.5¢ per piece in postage. If you like, we will handle the printing and the mailing. Quantities from 200-5000 pieces available. 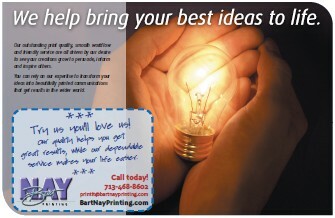 We’ll print and mail your advertisement for as low as 40¢ per piece...postage included. We offer a turnkey package where we will print and mail (postage included) 5000 8.5”x5.5” postcards to the addresses surrounding your business for as low as $.40 per piece. That price includes printing, postage and mailing the piece. Ask about smaller quantities that are available at similar savings.